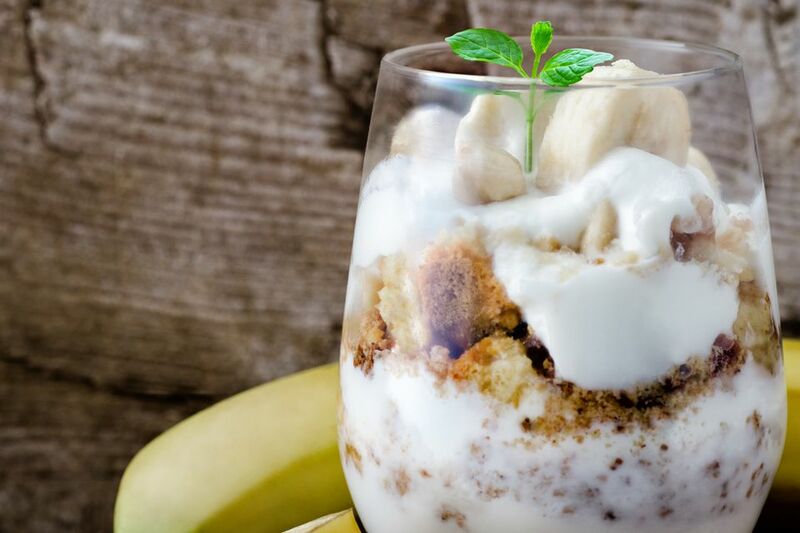 This pudding recipe is made with homemade vanilla pudding that sits atop layers of graham cracker crumbs and sliced bananas and then is topped with a fluffy meringue. It's a comfort food dessert that can call you back to your childhood, making it a popular homespun dessert to take to potlucks or serve at gatherings. The beauty of this recipe is that it features simple ingredients you might already have in your pantry. While you could use a vanilla pudding mix instead of making your own, homemade gives you full control over the ingredients. Lightly butter an 8-by-8-inch baking dish. Separate the eggs; put the egg whites in a clean, grease-free bowl—stainless steel or glass—and set them aside for the meringue. Whisk the egg yolks in a saucepan or in the top of a double boiler. Combine the sugar and cornstarch in a separate bowl and mix thoroughly; add it to the egg yolks. Add the milk and whisk to blend. Cook the pudding mixture over low heat until it is thickened and creamy, stirring constantly. Remove it from the heat, add the vanilla extract, and stir to combine. In the baking dish, place alternating layers of graham cracker crumbs and sliced bananas. Top with the vanilla custard. To make the meringue, beat the egg whites until soft peaks form. Add the powdered sugar and continue to beat until stiff peaks form. Spread the meringue over the custard and bake for about 10 minutes, or until the meringue is nicely browned. For this recipe, you should look for fully ripened bananas that are at the peak of flavor, but not those that have a lot of black on the skin and have become over-ripe. It is best when the banana slices are soft, sweet, and no longer green. The bananas will begin to turn brown in the pudding, so it's a good idea to enjoy this dessert within a day or two of making it. For a more elegant presentation, you can make this pudding in separate custard dishes or ramekins for individual servings, which is nice for a dinner party. You'll often see similar recipes made with a commercial whipped topping rather than meringue, which would save you a step. Or, you could substitute homemade whipped cream in place of the meringue. For a Southern-style layered banana pudding, replace the graham cracker crumbs with broken vanilla wafers.